For the 2017 NBA Finals, ESPN and Sony Pictures' Spiderman: Homecoming took fans on a journey with Peter Parker in his quest to "just watch the game". In this four-part campaign, the adventure unfolded with spots running on ESPN and ABC Networks during the NBA Finals. Fans had the opportunity to see the story play out on-air, as well as online with complementary social commentary from talent. And in a unique collaboration between the ESPN VFX, CreativeWorks and Sony teams, three of the four spots incorporated nearly-live NBA Finals game footage, weaving in a highlight moment from the game that had just played out on the court earlier that same night. ESPN’s Cari Champion, pop culture superstar DJ Khaled, and NBA legend Magic Johnson encourage Snapchat users to “swipe up” to see the extended cut of the Spiderman: Homecoming NBA Finals story, including all four on-air spots plus 30 seconds of bonus footage that didn’t air on TV. 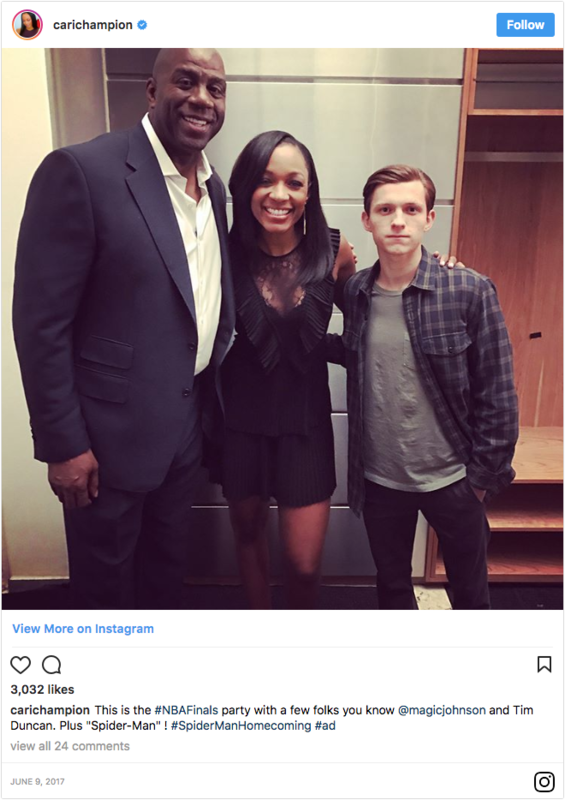 Cari Champion posts on Instagram about attending Tony Stark's NBA Finals party.